Fernie Women on Wheels is a group of passionate mountain bikers that are more focused on camaraderie than competition. Heather Lavers leading a group over the Eco Terrorist boardwalks in Ridgemont on Wednesday. Heather Lavers started the group in June by creating a Facebook group and inviting her female friends to join. She decided to use the page to organize weekly Wednesday evening bike rides, and was surprised by how popular it was right off the bat. The last few rides have been so popular the group has been breaking off into smaller groups based on ability levels. Dawn Scarrow, from Toronto, has gone along for the last two rides with the group while she visits Fernie. She said she also liked the no-pressure atmosphere. The group always finds a venue for a cool post ride beverage, a good opportunity to discuss how their ride went and share tips. They also hold maintenance sessions and skills sessions, and even one week had a talk about wildlife safety from Kathy Murray, WildsafeBC Community Coordinator. “We try to cover all the different aspects of mountain biking, from safety, to repairs, to skills, to socializing!” said Lavers. The group meets every Wednesday at 6:30 p.m. at The Guides’ Hut on Second Avenue. 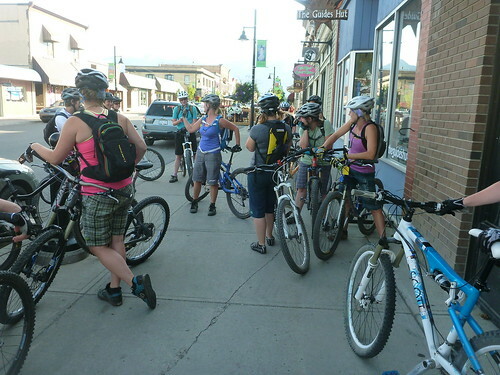 To get involved, join the Fernie Women On Wheels Facebook group, where, as well as finding out where the next ride will be, you can also share biking tips, arrange a buddy for another ride and hear about which stores in town have some great deals!